FirstNet consultations with states and territories are expected to take more than a year, during which time answers to questions regarding eligible users, partnerships, 911 coordination and funding models will be sought, according to panel at the NENA conference. It will be at least a year before any state or territory will have network plan that can be considered by a governor, who will have to make an opt-in/opt-out decision before work to deploy a much-anticipated broadband system for public safety can begin, a FirstNet official said this week. Amanda Hilliard, FirstNet’s director of outreach, made the statement while describing the consultation process that FirstNet will have with states and territories during a session entitled “The Synergy Between 911 and FirstNet” at the National Emergency Number Association (NENA) conference that was conducted in Nashville, Tenn. Given this timetable, there is still an opportunity for stakeholders—like 911 representatives—that have not yet been involved in FirstNet-related discussions to have their input considered as the plan for their state or territory is formed, Hilliard said. According to the law passed by Congress in February 2012, FirstNet will present its network-buildout plans for a state or territory to the governor, who will have 90 days to determine whether to accept the plan or choose to “opt out” of the plan. If a state chooses to opt out of the FirstNet plan, it is still responsible for deploying a public-safety LTE network that meets FirstNet’s technical and interoperability standards. FirstNet plans to conduct its first consultation meetings with states and territories beginning in “late July,” Hilliard said. With both FirstNet and next-generation 911 needing reliable, redundant broadband connectivity, there is an opportunity during the planning stages of both public-safety initiatives to make efficient use of scarce resources, according to panelist Walt Magnussen, director of Texas A&M University’s Internet2 Technology Evaluation Center (ITEC). 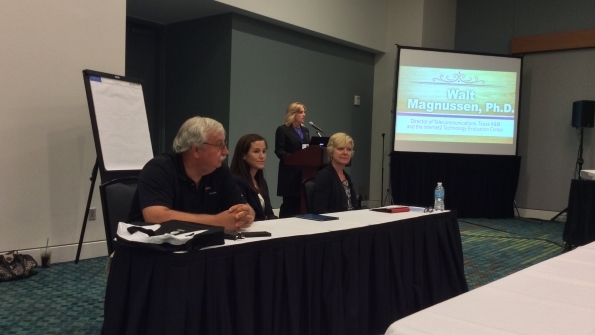 “You’re looking at a lot of bandwidth required to make FirstNet become a reality,” Magnussen said. “On the other hand, the ESINets [supporting next-generation 911]… are also going to broadband services, because we’re now delivering video and a number of other media, which means we’re also going to have a very bandwidth-intensive network.